Noémi Lefebvre, Blue Self-Portrait, Trans. by Sophie Lewis, Les Fugitives, 2017. The inner monologue of a woman haunted by German composer Arnold Schoenberg's portrait, following a complex romantic encounter with an American-German pianist-composer in Berlin. As the irresistible, impossible narrator flies home she unpicks her social failures while the pianist reaches towards a musical self-portrait with all the resonance of Schoenberg's passionate, chilling blue. A contemporary novel of angst and high farce, Blue Self-Portrait unfolds among Berlin's cultural institutions but is more truly located in the mid-air flux between contrary impulses to remember and to ignore. In Blue Self-Portrait Noemi Lefebvre shows how music continues to work on and through us, addressing past trauma while reaching for possible futures. A flight from Berlin to Paris takes an hour and forty-five minutes. This is enough time for a long nap, an unhurried conversation, or, if you’re the narrator of Noémi Lefebvre’s Blue Self-Portrait (Les Fugitives), it’s the perfect amount of time to brood. In the first of Lefebvre’s novels to appear in English, a woman on just such a journey unleashes an agitated inner monologue following a romantic encounter with a pianist in Berlin. Her rapid-fire, run-on thoughts rove over the places she’s just visited (Café Einstein and the cinema at the Sony Center), her failings (a recently ended marriage, her insufficient education), and her in-flight surroundings. She also happens to be reading the correspondence of Theodor Adorno and Thomas Mann. Always, she returns to obsessing over the pianist, their interactions, as well as his own obsession with Arnold Schoenberg. 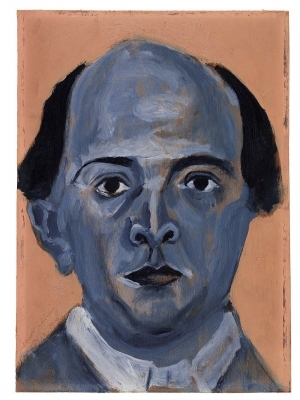 If Schoenberg had not been a major twentieth-century composer, we would know him as a minor twentieth-century painter (his work Blue Self-Portrait lends the novel its title). It becomes clear through her musings that, far from simply getting over a love affair, the narrator is ultimately grappling with her own relationship to art. Her anxiety about men—whether her beaux or beaux esprits—is entwined with misgivings about the quality and seriousness of her own ideas; after all, if societal notions of intellect are masculine, any female relation to the intellect is in some sense a relationship to masculinity. This is the narrator’s unsolvable problem, laid bare again and again in painful yet eager honesty. The book’s subversion lies not in exposing these well-known phenomena, but in the cavalier and self-evident tone in which they are presented to us. An intelligent woman is supposed to raise herself above these anxieties; the narrator revels in them. The narrator is particularly ashamed of having talked too much, of having committed the female sin of chattering at the pianist, extremely serious intellectual being that he is. In fact, the irony is that Blue Self-Portrait is itself a relentless torrent of chatter sustained for the length of its 150 pages (or 105 imagined in-flight minutes). She has diagnosed her problem, and she just can’t help herself. Her verbosity showcases her hyper-self-awareness, the fact of which, “in the purest tradition of girls without any self-control,” she is aware. Her posture ranges from self-reproach, “I disturb, I’ve never done other than disturb, I disturbed the pianist just like I disturbed a whole pack of people who nevertheless were quite well disposed to me,” to glib self-deprecation regarding “the unquenchable stream of observations and ingenious associations that flowed from me, each idea more striking, subtle, singular and wondrous than the last.” A portrait of female intelligence emerges, one that cannot “behave” appropriately in a way that is either feminine (modest, reticent) or masculine (momentous, self-assured). She operates in a mode of loquacious levity, self-absorbed absurdity, a style that lets her move lightly from one topic to the next, from one ponderous thinker to another. Adorno, Mann, Schoenberg—fun, right? The very flippancy that the narrator regrets in herself gives the text its fleet-footedness in such laborious territory. Her thoughts are abuzz with German intellect and German hubris, which are normally things that are too leaden to “buzz.” Its luminaries and abominations flit through her mind, reflecting the irresistible intellectual brilliance that attracts her and the damaged, anti-social malformation of spirit that she feels separates her from it: “Humboldt’s education is like that of Schiller an exemplary education, an ideal education, die Erziehung des Menschen, that of Goering was not and all’s done that’s done.” When she laments her own deficient education, one can’t help but feel that the little Goering on her left shoulder is tormenting the Humboldt on her right. Her idée fixe is really the proper formation of the human soul—how a person should act or be. he first of Noémi Lefebvre’s three critically acclaimed novels to appear in translation comes courtesy of the relatively new but already impressive indie press Les Fugitives. Its commitment to making the work of hitherto untranslated French female authors available in English is a heartening crusade in these dark times. So far it has given us Nathalie Léger’s fascinating, genre-bending Suite for Barbara Loden and Ananda Devi’s excellent Eve Out of Her Ruins. Blue Self-Portrait is the third book in its publications list. “You’ll have to change that way you talk, my girl, I told myself in German, in French, then in German again, then in French, as if I was my own mother,” says the protagonist to herself at the outset. Her plane has just taken off from Berlin and, for the 90 minutes of its flight to Paris, we are at the mercy of the highly entertaining cycles and reflections of our unnamed heroine’s linguistic neuroses. Accompanied by her sister, whose interjections and observations punctuate her digressions, she’s also cringe-suffering over the memory of a man she left behind. He’s an American-German composer, whose own thoughts on their brief interlude together – and other subjects – also intrude over the course of the novel.These subjects, ranging from anxiety that his sexual desirability is dependent on his girlfriend imagining she’s sleeping with the next Schoenberg, to the paralysing effect of nazism on art, to beautiful insights into the compositional process, ensure that the book is no melancholic meditation on lost loves. For a comparatively short novel, Blue Self-Portrait yokes together an extraordinary profusion of ideas. Its author’s background in music (a PhD in the subject) and politics (informed by her German and French national identity) is always manifest. This is a dense, intense examination of the disruptive effect that ideas about art and politics have on one another. Lefebvre is particularly interesting on the effect of music on the historical memory, and vice versa. The protagonist and the composer share an obsession with musician and painter Arnold Schoenberg: the former with his Blue Self-Portrait, the latter with the impossibility of his music, and music generally in the aftermath of nazism and the obliterating horror of the Holocaust. A quote from Schoenberg’s 1931 speech on Berlin radio – “The conviction that I have written nothing I should be ashamed of forms the foundation of my moral existence” – is singled out for repeated reflection and becomes a touchstone. Indeed, the concept of shame, from the personal to the political, is a recurrent theme. This is where much of the fun in the book surfaces, with the main character seemingly incapable of extricating herself from a furnace of scorching social embarrassment. She professes that her essential state of “not-caring”, as diagnosed during a particularly troublesome tennis match with her former mother-in-law, is at the root of her problems. “The not-caring prevents me from living normally, speaking normally, eating normally, sleeping normally … from measuring the seriousness of my own body, the substance of my own body, my body’s malleability, my body’s presence, it was as if I didn’t have a body I thought as I ran to and fro across the court, winding myself and missing the ball with an impressive frequency that visibly irritated my opponent.” Yet the consistency with which she relives agonising moments of mortification – “I recalled driving the pianist-composer-driver right round the bend by making him go up and down Neue Kanstrasse three times because I could no longer find the entrance to my Polish hostel, and my shameometer measured a new record” – are more reflective of a person who cares too much. According to Lefebvre, life and art are at their sharpest, and most truthful, when wrestling in the gaps between contradictions. The “not-caring” quote is also illustrative of the linguistic style that has been fiendishly well reproduced here by translator Sophie Lewis. While this reads initially as straightforward stream of consciousness, it soon emerges that Lefebvre is applying Schoenberg’s compositional innovation of the “developing variation” to language. This is the theory that a central idea contains within it all that is required for the creation of variations on it. By using it in this way, the author creates a cunning maze in which her protagonist’s stream of logical, linear thought paradoxically begins to go round in circles. Les Fugitives is an independent publishing house with a very precise remit. It publishes only short books that have been written by award-winning, female, francophone writers who have previously not been translated into English. If that sounds incredibly niche, it isn’t1. Think of how many books are published, think of how many literary awards are given, think of how many writers are women and think of how many places in the world people speak French. With these rules, they obviously have a limited pool of books to choose from, but still a large one. And though I haven’t read the previous two books they’ve put out, if Blue Self-Portrait is anything to go by, then Les Fugitives is clearly doing the English world of letters a great service, because this is a belter. 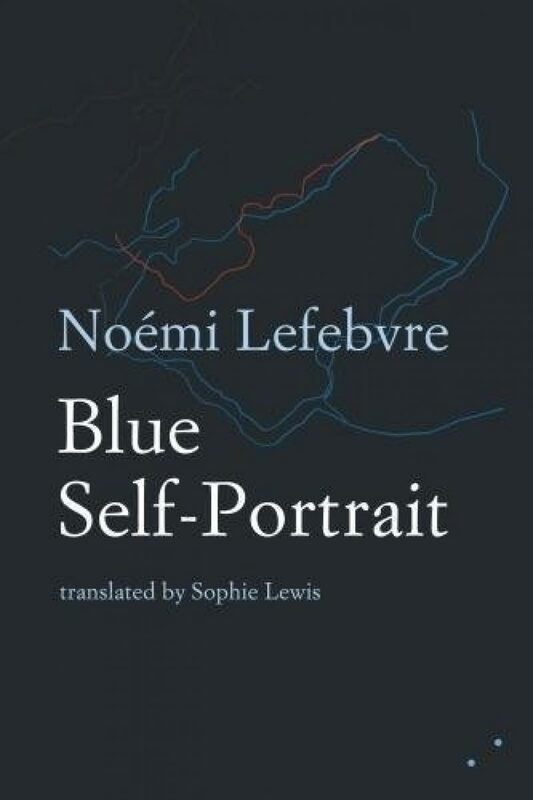 Blue Self-Portrait is written by Noémi Lefebvre and translated by Sophie Lewis, and was originally published (in French, obvs) in 2009. It is a short stream-of-consciousness novel from the perspective of a woman as she flies from Berlin to Paris, reflecting on a romantic interaction she had with a German-American pianist/composer. It’s funny, it’s engaging, it’s fiercely intelligent and it often teeters on the edge of being deeply moving. In short, it’s a very good book. The novel’s protagonist and her sister sit side by side on an aeroplane, looking out of the window and looking into the past. There is a lot in this book about classical music (including contemporary classical music), which is not something I know very much about, so was worried I might find the text a little alienating. However, the way the music is written about is very much from a responsive position, the way music affects feelings, affects moments, affects mood, and Lefebvre engages with this almost indirectly by having her protagonist recount in great detail the (male) pianist’s response to a painting (guess the colour and the subject from this novel’s title) and his desire to make music about it. The painting – which you can see above – is by the composer Arnold Schoenberg, and as the pianist struggles to formulate an artistic response to this piece of visual art and understand his own place within the canon of musical creativity, the protagonist evokes at length the problematic responses she regularly has to art, to music, to existence, which seems to constitute a simultaneous indifference and over-engagement. As a human, she obsesses over the accusation of her ex-husband’s mother that she is “uncaring” (also translated as “insouciant”, “indifferent”, “not-caring” (there’s a note about it at the end)), which in itself exposes the hypocrisy of the statement. She cares too much to appear caring, she cares about caring, the book is a near-breathless exercise in awkwardness, anxiety, worry, it’s an exciting evocation of a kind of mind I recognise, one where an individual obsesses over the way she is sat and how other people will judge that decision, one where weird ideas recur in a way that other people find confusing, one that considers, remembers, recalls, both her own memories and other people’s. We slip into the memories and experiences of the pianist almost by accident, as the narrator recounts stories he has told her; we are almost dragged into them as if they’re first-hand. Her empathy is important, her emotional intelligence is astute, her perceived notion of not-caring is wrong because she is overwhelmed by caring, by thought, by memory. Like Proust (whose name crops up a lot) she is sucked into memory after memory, but unlike Proust this is a short work, and one where the character doing the memorialising is moving, rather than static. The protagonist flies, and the view from the window changes – which in itself provokes the resurgence of memories – and she comments on her experiences in the plane with her sister (who threatens to begin playing the violin mid-air at one point) and with the book[s] she is reading, letters between Thomas Mann (also a literary writer with a keen interest in music) and Theodor W Adorno, a critical theorist. This is a text filled with ideas, with cultural and artistic references, and also to the recurring motif of a cow grieving for the loss of its calf, removed at birth. It is a novel about displacement, about loneliness, about disconnection and the fear of disconnection, about family and love, about art and regret; in a short work it is a deeply exploratory tone, and its content in combination with its long sentences and huge paragraphs make for a demanding read, but one that is very rewarding. We are in Berlin, we are in France, we are in a plane; we are between countries and places and present and past, we are between different minds and different moments… Lefebvre’s narrative is rich and engaging, and Lewis’ translation – which I imagine must have been a tough one to do – never falters for a moment. This is a weighty, literary, text, and other than length it is not a “small” book. It is ideas and emotion-rich, and for anyone else who’s all into this contemporary stream of consciousness revival, it’s definitely worth your time. Blue Self-Portrait, the debut novel by Noémi Lefebvre, was originally published in her native France in 2009. It’s now being released in English translation by Les Fugitives, a new press that publishes short works by francophone women authors previously unavailable in the UK. The translator, Sophie Lewis, is a former Senior Editor with And Other Stories. This is a somewhat difficult book to characterise. In essence, it is the internal monologue of a woman on a plane ride back from Berlin. She happens to be reading the correspondence that passed between Thomas Mann and Theodor W. Adorno. In her mind she moves back and forth between German and French, snippets of which appear in the text, as she relives her unusual romantic encounters with a male pianist/composer in Berlin, such as a meeting at the Kaiser Café and a film at the Sony Centre. Fragments of her personal history share space with incidents from wider history: her failed marriage versus flying over the Wannsee and thinking of the Conference that took place there in 1942. Noémi Lefebvre is the author of three novels, all of which have garnered critical success in France: L’Autoportrait bleu (2009), L’état des sentiments à l’âge adulte (2012) and L’enfance politique (2015). She is a regular contributor to the website Médiapart and to the bilingual French-German review La mer gelée.